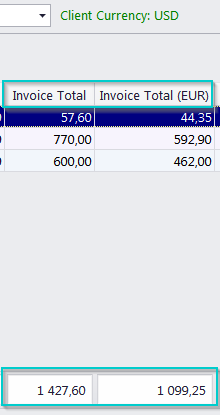 First, navigate to the Clients>>Invoices table and make sure that the Footer is enabled by right-clicking and navigating to "Grid Settings >> Show Footer"
Then, click the asterisk symbol in the uppper-left corner of the table and check "Invoice Total (EUR)" The parentheses will always contain the code of your base currency. You will see the total of all entries in the table at the bottom of the window. 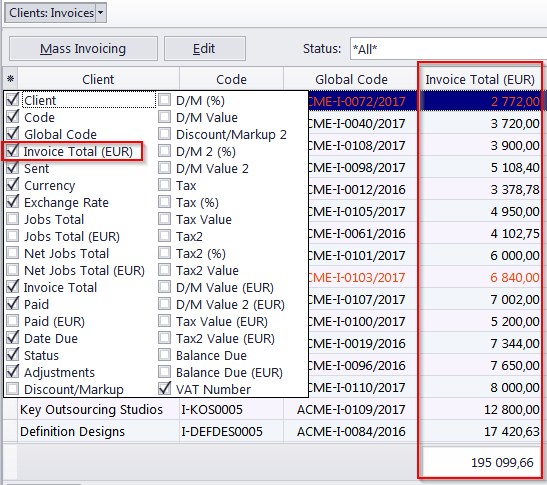 If some of the invoices are partially paid, you should also enable the "Balance Due (EUR)" column.